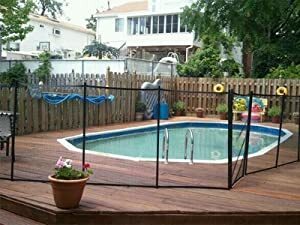 How can I choose the best pool fences? You have unlimited choices when it comes to choosing a swimming pool fence. A pool fence separates your pool from the other parts of your home without leaving any open space that can lead to your pool. Therefore, it is vital to choose a fence that will meet your pool needs. Choosing a pool fence isn’t as hard as some people want it to sound. You only need to ensure that you are getting the perfect pool fence. If you are a newbie on the market of pool fences, then you should expect to get some of the following options. Wooden Pool Fences – Wooden fences are perfect for pools that have a nature designed-theme. However, wooden fences don’t last long. You need to replace them after a few years. 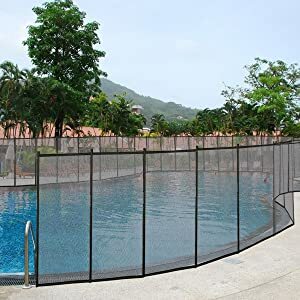 Mesh Pool Fences – Mesh pool fences are recommended for homes with small kids. They offer great protection and are durable. 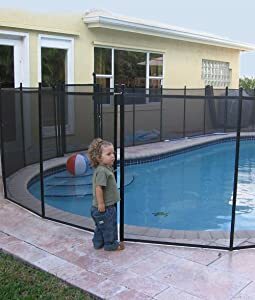 Small children cannot climb over or crawl under mesh pool fences, unlike other types of fences. Steel Pool Fences – If you are looking for privacy, steel pool fences are your best option. However, steel pool fences require constant maintenance since they are prone to rust. Glass Pool Fences – You can also install a glass pool fence. However, glass pool fences don’t provide privacy and are expensive. In addition, they require regular maintenance and can shatter and be a hazard at your pool. Flat Top – Flat top style is the main style for most pool fences. Vertical bars are joined together by horizontal ones near the bottom and top of your pool fence. Double Top – Double top fences are similar to flat top fences, except that they have an additional horizontal bar near the top side. Regularly, ornamental elements are added between the two bars. Loop Top – Loop top fences use a long piece of bar to form two bars as opposed to using 2 separate bars like the double top model. The metal is curved to fit the desired design. Wire – Wire pool fences are made with thick metal wire bars as opposed to hollow metal tube bars like the styles above. The outcome is a more weather-resistant and durable pool fence. Here is a list of the important elements that you should ensure that your pool fence has. The list will make your choosing and buying process much easier. The Academy of Pediatrics and the US Consumer Product Safety Commission recommend a self-closing, self-latching gate. This gate automatically shuts behind you due to its magnetic power. Hence, even if you forget to shut the gate, you can go about with your other chores knowing that your kids will be safe. The heart of any swimming pool fence is the mesh. Imagine your kid pushing against the fence. If you get a weak mesh, your child will push through and enter your pool area. Tension-based support is an important term that you should watch out for when choosing a fence. With all pool fences, normal wear and tear will occur. That doesn’t mean that you get a fence that isn’t resistant to punctures and tears. In case it gets a tear, the mesh should have the ability to return to its normal shape. Vinyl and polyester mesh coating are some of the key specifications that you should ensure your fence has. They are mildew resistant and enable easy cleaning, as opposed to grainy finishes that attract dirt and growths. The rule is; the higher your pool fence, the better. With that said, you should get a fence that is at least 4 feet high. Remember that your child is growing. Hence, as opposed to getting a new fence every time your kid grows a foot tall, the most affordable investment is to buy the tallest possible pool fence. The quality of the poles is also a major thing that you should consider when choosing your pool fence. The poles need to be triple-reinforced to meet all the safety standards. The best fence uses aluminum support poles. Aluminum provides both strength and tension for your fence, so the smaller the distance between two poles the better. Poles should also feature a reinforced ultra-tough additional exterior layer and bend, but not break the interior player. For additional safety, your pool fence mesh should be bordered on all corners with a vinyl border. This provides a cool finish for your fence and also prevents the unraveling of the mesh. The material used should have visible reinforcement inserted into the vinyl to offer additional strength to your pool fence and prevent sagging. The border will make your pool even stronger and more durable. UV resistant mesh that won’t get damaged by the sun. Rounded edges and round-head fasteners (no sharp corners). Here is a review of the top pool fences on the market today. 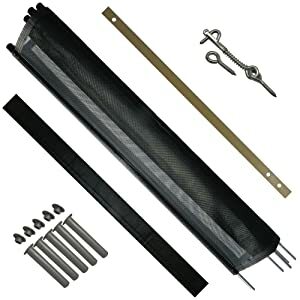 There is probably a no better alternative for protecting your kids from unsupervised access to your pool than erecting the Pool Fence DIY by Life Saver Section kit. This pool has one major benefit that most fences don’t offer, installing it yourself. It comes as a single 12 feet long fence that is 4 feet high and is reinforced by five integrated aluminum posts. The fence comes with deck sleeves and a safety latch. What it does not come with and need to be bought separately is the gate. However, even without the gate, this fence is still an effective option for securing your pool. Doesn’t come with a gate. Designed for strength and durability, the Giantex safety fence is 4 feet high and 12 feet long and is made of aluminum. It is an easy to assemble product for in-ground swimming pools and is a great product for keeping pets and children out of your pool area. If need be, you can shorten this fence to accommodate the specific size of your pool area. The best thing, you can easily remove and then reinstall the fence without much hassle or even damaging it. This makes it very convenient to take down and put up your pool when you want. The fence comes with a useful instruction guide and all the necessary hardware for installing. An integral part of your swimming pool is the fence and Pool Fence DIY Self-Closing ensures that you secure your pool to prevent your kids from entering unsupervised. This fence comes with a self-latching, self-closing gate that will make your pool area even safer. The fence works with firm double-truss uprights, very reliable magnetic latch, and self-closing gate hinges (designed specifically to secure your gate around your pool). The fence has a 4 feet height with a 2 feet walk-through opening. The best feature, the fence is powder-coated and has aluminum material that makes it last for long. It also has an industrial-quality Textilene PVC-covered nylon mesh. Install support from the manufacturer. Needs a rotary hammer drill when being installed. This is a vinyl pool fence that was designed to attach to the installed braces of your swimming pool. Best for above ground pools, the fence offers 8 complete sections, but you can easily add more if you want to. Everything you need to set up GLI Above Ground Pool Fence Base Kit provides, so it has the instructions, posts, fencing pieces, and the hardware you will need. Although only meant for above ground pools, it works very effectively in securing your pool to prevent kids from entering unsupervised. One more thing, you can easily attach the fence to another fence if your pool is constructed into a deck. Sturdy enough to withstand all weather conditions. Easy to add extra fence parts. This fence comes in pre-assembled parts that are 12 feet in length and 4 feet high, with five poles spaced 3 feet apart and you can easily shorten to fit your needs. If you want to remove the fence, you can easily do it without seeking the help of another person. What makes the Sentry Safety DIY Pool Fence by EZ-Guard special is its durable construction. Its poles are 100% rust free and feature a 3 layer design: the top layer which is powder-coated aluminum, the middle layer which is made of PVC, and the bottom layer which is made of stainless rod. The rod is especially durable and doesn’t break easily. With this fence, you can be assured that you own one of the toughest kid safety fences on the market today. Need a rotary hammer drill when being installed. Classic Guard is only available in black color and measures 12 feet long and 4 feet tall. It is made of durable, tear and UV resistant mesh, enabling it to withstand the harshest of weather. The fence is bordered on all corners by a strong lining that prevents fraying. The fence comes attached to poles, spaced 3 feet apart, to ensure that you get an easy time when installing it. The poles are attached to the mesh by an aluminum backing strip that is further held by stainless steel screws. The product is easy to install. The Water Warden 4 Inches Pool Safety Fence is a simple mesh that adds safety to your swimming pool. 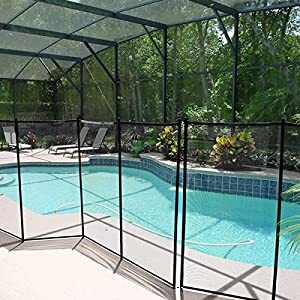 It isn’t meant to add privacy to your pool or even block off your yard, but it is a superb way to keep your kids out of your pool. If you order this fence, you won’t get a gate. However, you will receive a measuring template, hardware for setup, an installation video, and instructions to help you have an easy time when installing it. Hence, if you like to do some handy work or you are DIY kind of person; this fence won’t give you any trouble. It is very easy to set up and compatible with most safety gates found on the market. The best part, you can get this fence in either 4 or 5-foot height with 12-foot length/kit. It offers value for money and lasts long. Keeps kids out of the pool area. Not recommended for large pools. Our top pick of the pool fence that will give you value for money is Pool Fence DIY by Life Saver Fencing Section Kit. 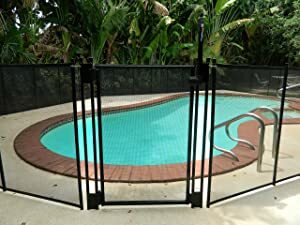 You will probably get no better alternative for protecting your kids from unsupervised access to your pool than erecting this fence. You can easily install it and features five integrated aluminum post. Remember to follow the manufacturer’s instructions when installing your pool fence. However, here is a process that you can follow when installing most types of fence pools. Arrange a rope or a garden hose at least 3-foot from the edge of your swimming pool to determine where you will install your pool fence. Also, ensure that you leave the opening for the gate; mark it with a chalk. Draw the rope or hose tightly and measure it to get an idea of the length of the fence you will require. Also, buy a fence that will complement the décor of your house while providing the safety needed. Take the 4 feet long stick and cut a 3-foot long piece from it. This is for measuring the distance between the pool fence sections. Take the remaining piece and cut a 2½ inches long piece from it. This will measure the distance between the panels. Using a waterproof marker, mark the areas using the 2½ inches and 3 feet stick to get the right spacing. Repeat around your pool. Ensure that you mark correctly since you want to drill holes over them. Ensure that your machine has the cement bit to drill holes into the deck. Measure the size of the plastic sleeves and measure, cut, and tie a piece of tape on the drill bit where it hits the sleeve. This is to prevent you from drilling excessively deep holes. Ensure that you wear all the protective gears before you begin to drill. Insert the sleeves into these holes in order to hold the poles. Start at the gate and work your way around your swimming pool. Leave the opening where you will install the gate. Here, insert the spring latch, then the gate. Now you have a safety fence around your pool. Q: Can I install a pool fence around a swimming pool that has dirt, sand, or grass? A: Yes. However, you need a longer spike to be able to do this. Q: Do pool fence comes with warranties? A: Yes. The best brand offers a warranty against production defects. Q: I only need my pool fence to be around when my grandson comes over. 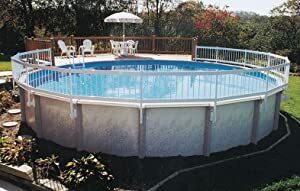 Is a pool fence easy to remove once installed? A: Some of these systems are very easy to uninstall and store in your garage. You can remove the whole fence within minutes without needing the assistance of another person. It is important you choose the best pool fences that fit your pool needs. The perfect fence will meet all the insurance and local legal standards while also providing protection around your pool. We have reviewed some great fences that offer value for money, so you can start there.